Of all the women Valentino has dressed in his 45-year career - from Jacqueline Kennedy to Mariella Agnelli to Gwyneth Paltrow - one red carpet moment stands out: When Julia Roberts wore a vintage black-and-white Valentino gown when she was awarded her best actress Oscar. "I have to be very sincere. The person that makes me feel very happy, also because (she) chose vintage, was Julia Roberts in `Erin Brockovich' when she got the Academy Award," Valentino told a news conference. "I was very excited. I was not in Los Angeles, but I saw on television, and I really was excited to see her when she appeared with my dress." Valentino, who has spent a career dressing the world's most glamorous women for the red carpet, walked it himself Thursday for the Venice Film Festival premiere of "Valentino: The Last Emperor," a documentary by Vanity Fair special correspondent Matt Tyrnauer. Tyrnauer followed Valentino around for the two years leading up to his retirement in January, catching him as he created gorgeous gowns for the runway and gradually accepted the idea of his retirement. 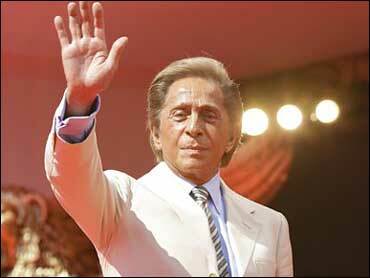 Valentino said he didn't perform for the cameras or try to hide any aspect of his personality - even when he got into disagreements with his longtime companion and business partner Giancarlo Giammetti. "When I work and I create, I am not very approachable. To ... know everything I say was being recorded did irritate me," he said. "The film was showing exactly what I am. There were moments of anger, when somebody says something that I don't like, but I was completely myself from the beginning to the end and nothing was edited." Tyrnauer praised Valentino and Giammetti for enduring the two years of filming, saying there were very few instances when they asked that the cameras be turned off - and those are included in the film. "It was amazing to kind of hang out with Valentino and Giancarlo for two years," Tyrnauer said. "They put up with a lot." Valentino expressed satisfaction with the final product and said he was full of emotion watching the documentary's premiere Thursday morning, which received a standing ovation. The documentary was shown out of competition. Valentino said he was never concerned that the film would demystify his world. "I don't think haute couture will ever really die. It's like a beautiful song, it will be there forever and it will never go out of fashion," he said.